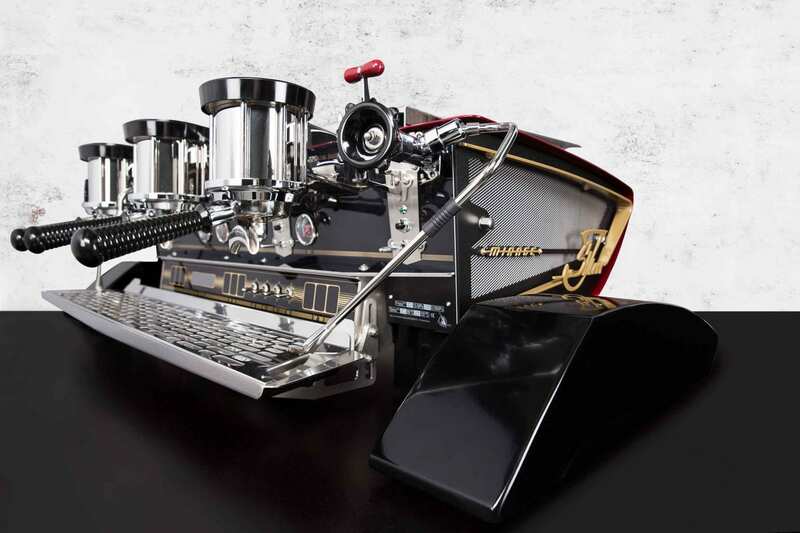 FOR PERFECTION TO BUILD THE BEST ESPRESSO MACHINE POSSIBLE. 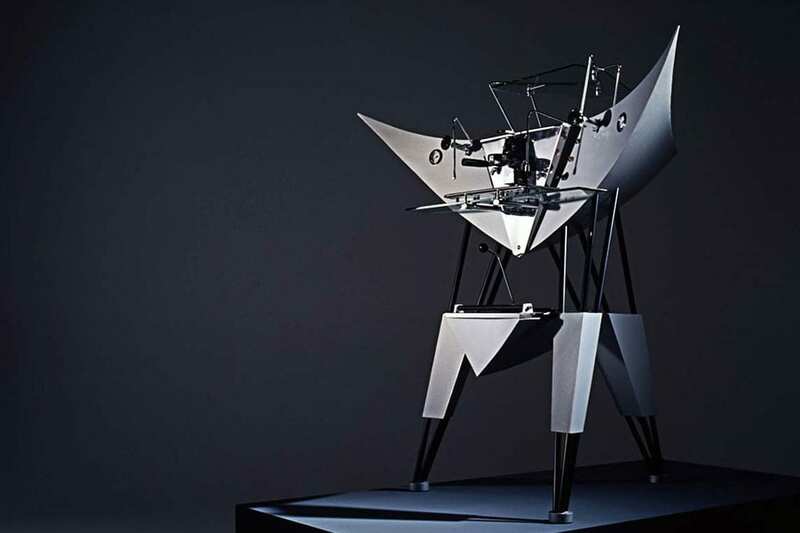 The very first machine created by Kees, part of the project to finish his Industrial Design study. As it suffered several explosions during construction, it finally was finished as a dummy, hence the name. The second ever machine, built when still at school. This time the machine actually functioned. The idea was to have a modern machine pop out of an old shape. Or maybe the other way around, the old shape still protectively hugging the new. 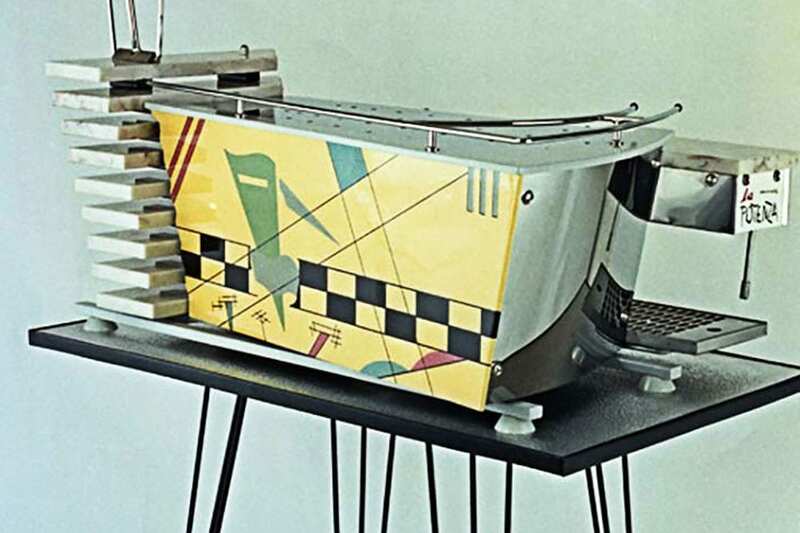 When supplying coffee at the end of the year exhibition, Kees received an offer not to be refused, so this was the first machine sold. 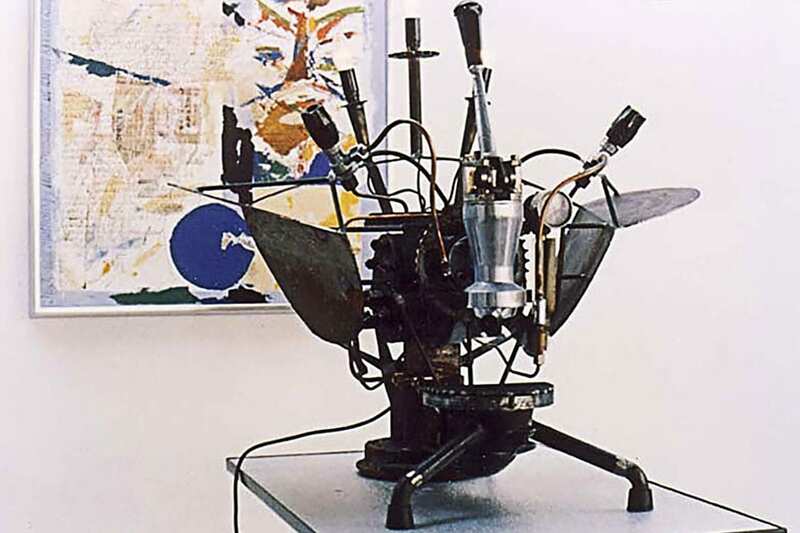 This one-group machine was constructed on commission. The first commission, from a local pizzeria. This restaurant was close to a bridge: Il Ponte. 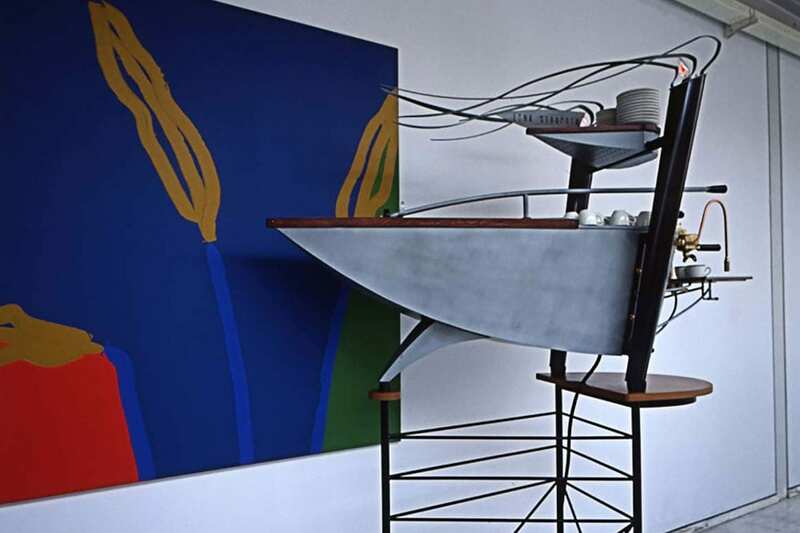 A well-known Dutch glossy magazine, Avenue, dedicated an extensive article on Kees` work. Part of the deal was to create a one-off machine to give away in a contest. Hand-painted body. Striking triangular shape. Roughly cut Carrera marble at front. 3 litre boiler with heat-exchanger. Huge stand-alone space-framed one-group machine, built for reception hall of marketing company “Lenting & van Etten”. Rear of machine consists entirely of glass, matted where it covers the machine parts. 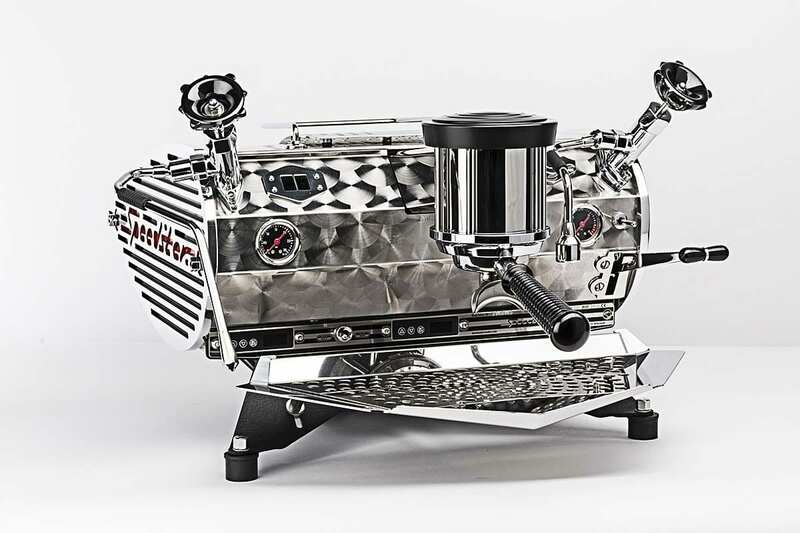 Fitted-out as a complete espresso brewing system, with grinder, knock-box and water-softener. Lots of light from within the machine, making it a living sculpture. 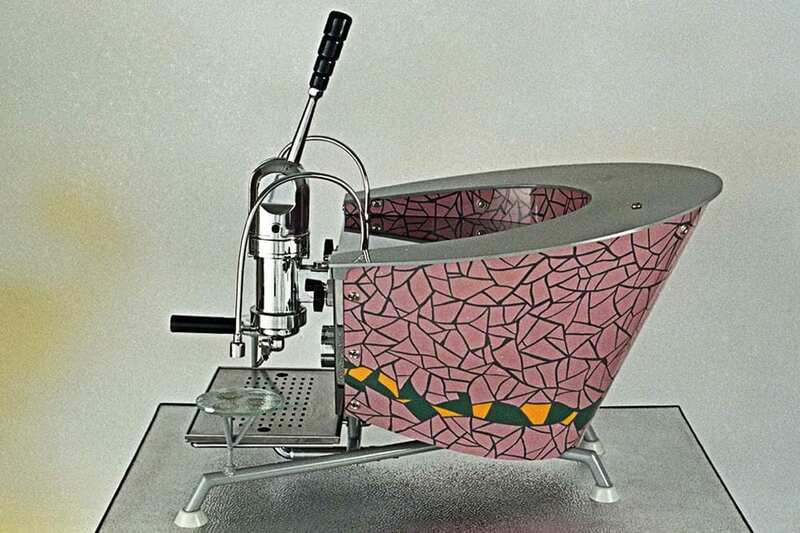 Two independently functioning one-group lever machines, created for Grand Café “La vie en rose”. 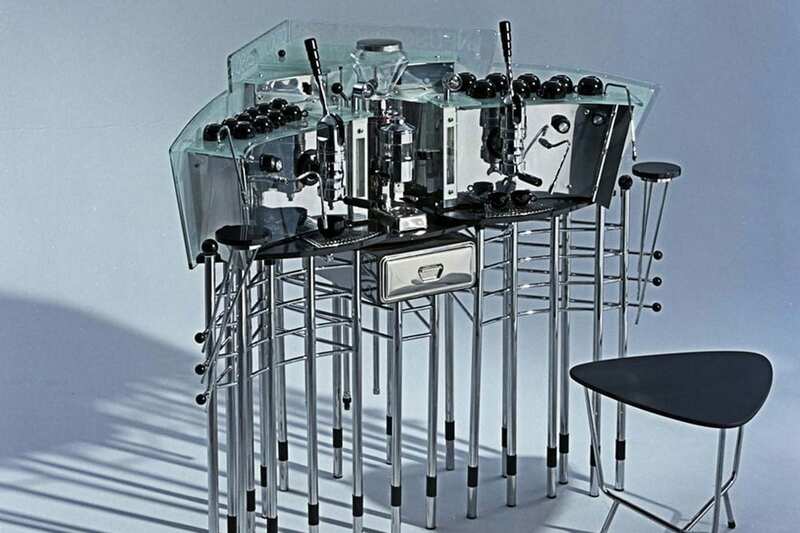 Total of 21 chromed legs, each one adjustable in height. Drip trays in black granite. Complete with knock-box and grinder. Lots of glass with light from within. 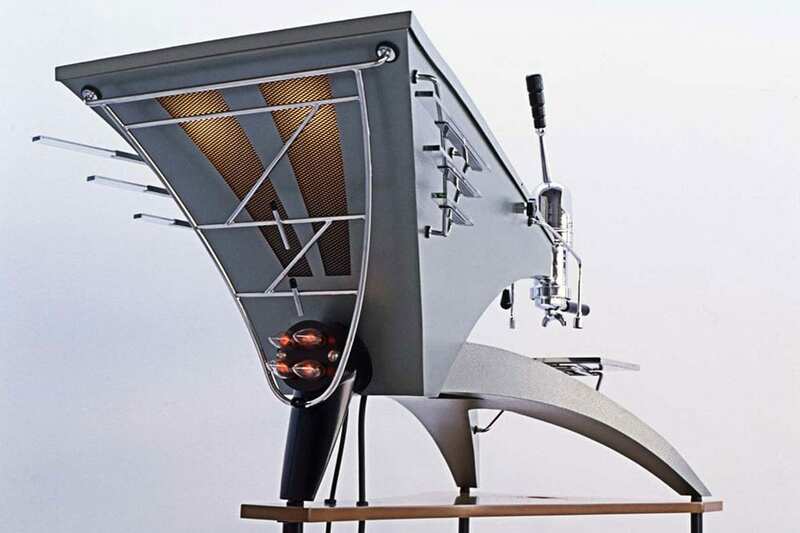 Built on commission for the Laurentis coffee roasting company. Tube lights at the rear, illuminating the large bent glass plates, react on the boiler pressure making the machine seem to breath. Lots of details gold plated to keep their shine. 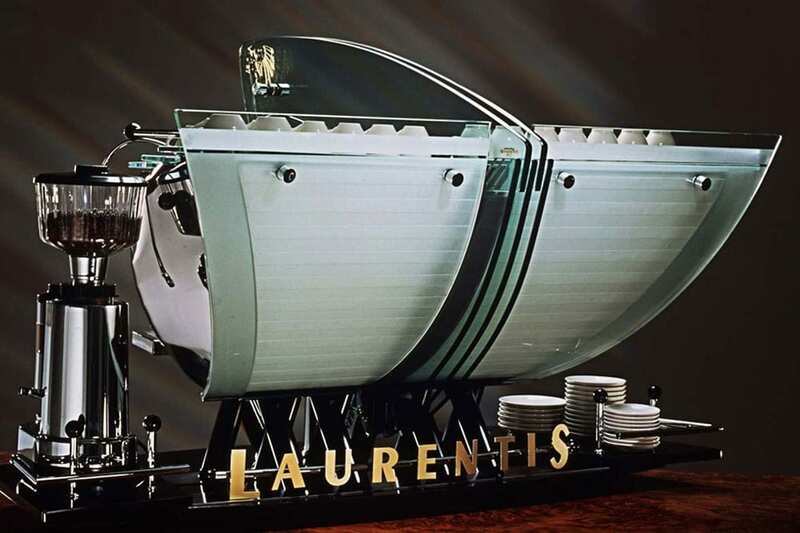 Because of the weight of all the glass and black granite, a special large bracket was constructed to lift the machine by 4 strong men. 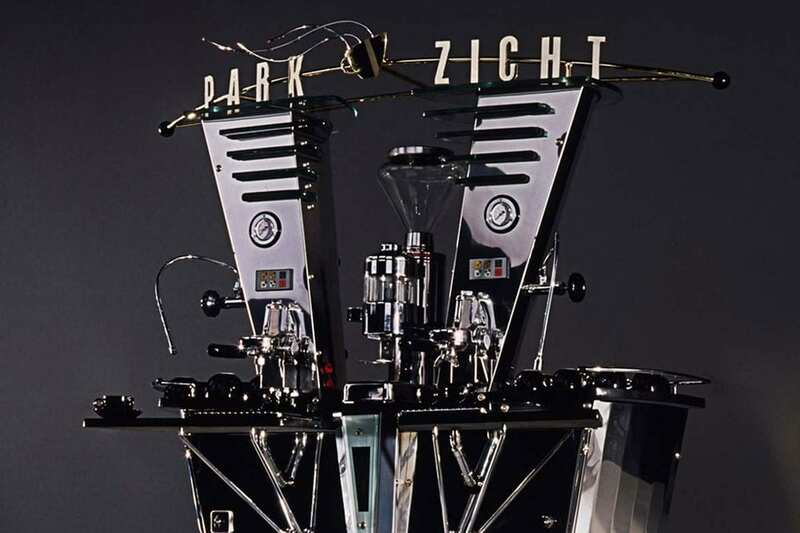 Designed and constructed for Café Parkzicht, Gorinchem, NL. White light inside both towers reacts on boiler pressure, illuminating the glass lines and the gold plated letters from behind. Tiny red lamps at the heat waves from the cup light up whenever coffee is brewed. To check the boiler level, a small light is installed at the glass tube between the drain trays. Aeroplane styled machine in plain steel with protective transparant coating. 2 mtr. between wing tips. 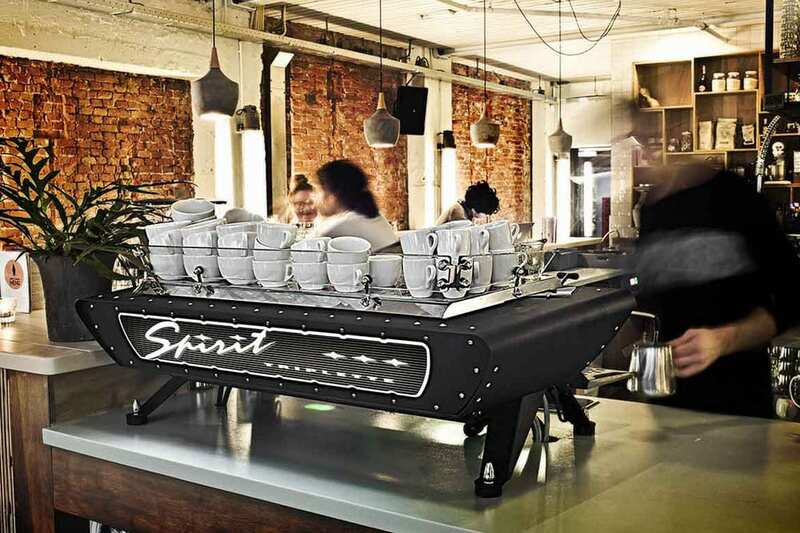 When large horizontal lever is pulled towards barista, the machine starts brewing. Left and right cup warmer trays are hinged at rear, can be opened like flaps to check inner parts. Created as free work, later sold with matching stand and grinder to headquarters of Lage Landen Autolease. 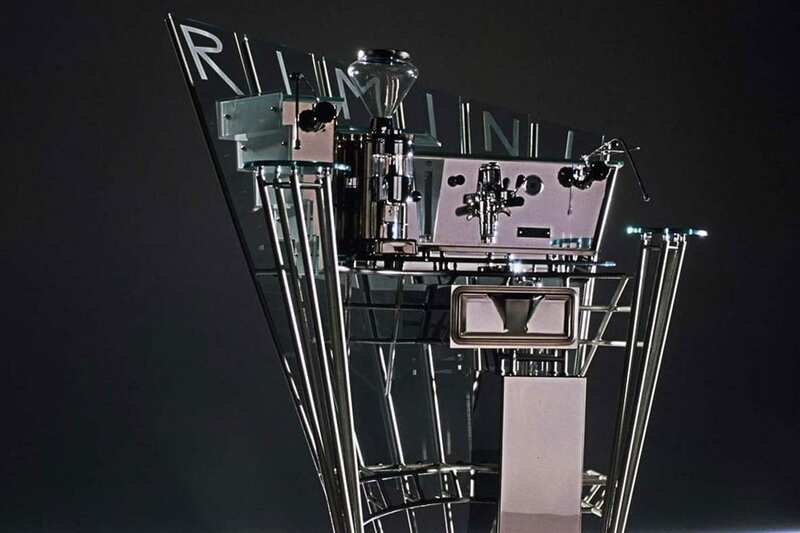 Espresso-sculpture, the second sculptural machine built on commission for Cap Gemini Netherlands. Large as life (2 x 2 x 2 mtr.) . 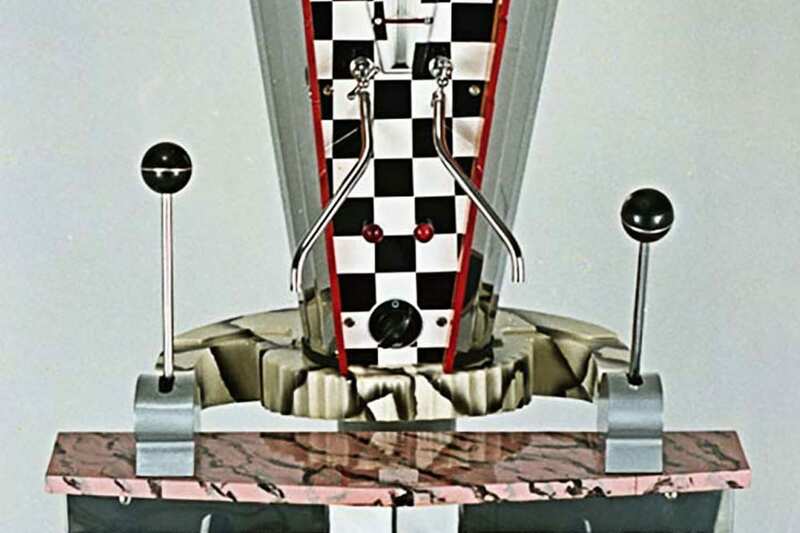 The V-shaped box between the legs holds the knockbox and a large light box illuminating the machine’s belly (again reacting on the boiler pressure) and the large vertical gear lever. Ocean liner inspired. Wooden deck. Long vertical lever with wheel at its end activates brewing process. Light from bottom of top deck illuminates cups on heating tray. Flaming lights at top of pillars. The Etna was purchased by Kent Bakke, Seattle. Deep and narrow machine (1.50 x 0.50 mtr.). Striking contrast between speedy bodywork and traditional lever group. Cup warmer-tray recessed deep into body, leaving the bodylines undisturbed. 4 Flaming lamps at rear react on boiler-pressure. Purchased by Kent Bakke, Seattle. Lots of pieces of rusty steel welded together, including motorcycle and car parts. The lights on top are connected to the heating-element, so these react with the boiler-pressure. First attempt for a series machine. A total of 13 were built. It is a huge two-group, with a height of 93 cm, depth of 100 cm and a width of 130 cm. Impala granite and a large bent glass canopy were used. There is a small lighted panel at the rear. 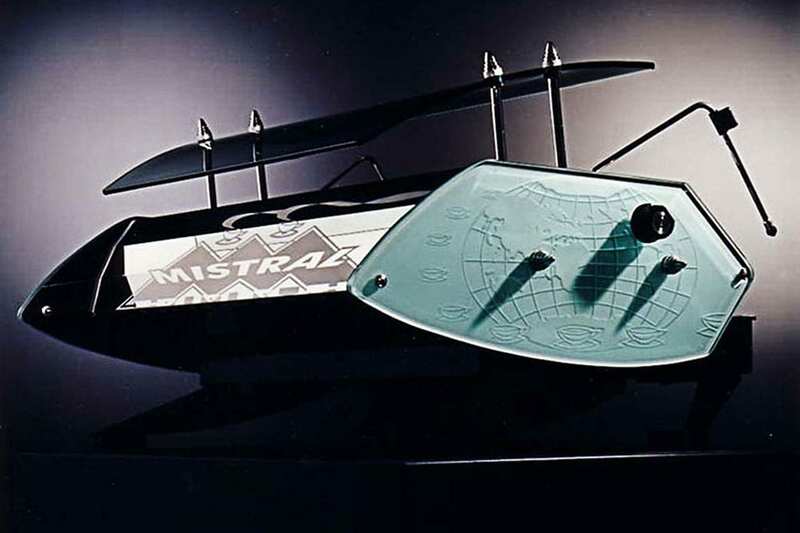 The Mistral was a first production machine, built in two- and three-group version. Several options were developed through the years. The last one was built in 2004, a total of 116 machines was produced. 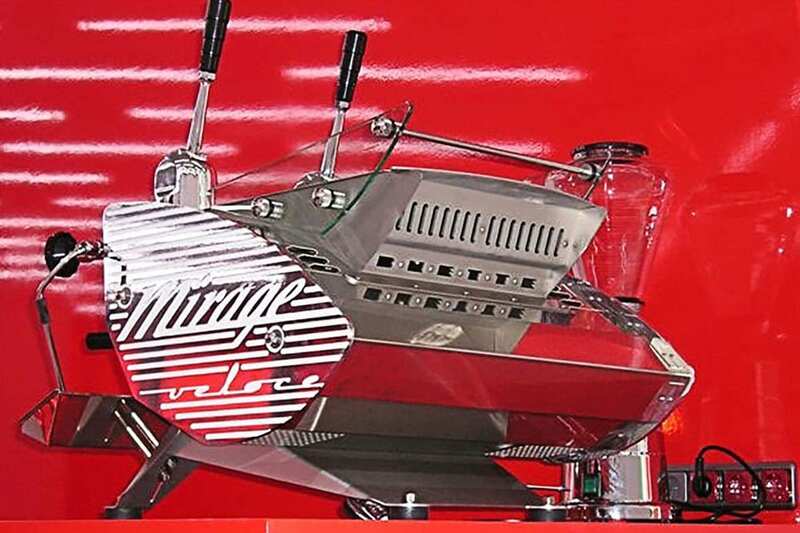 Equipped with the technically elegant and efficient thermo-syphon heat exchanger system with many updated technical details, the Mirage was an instant success. Through the years it was constantly further refined. 6 of these were done in 2001 as a quick fun project by Kees, each sold to family and friends. 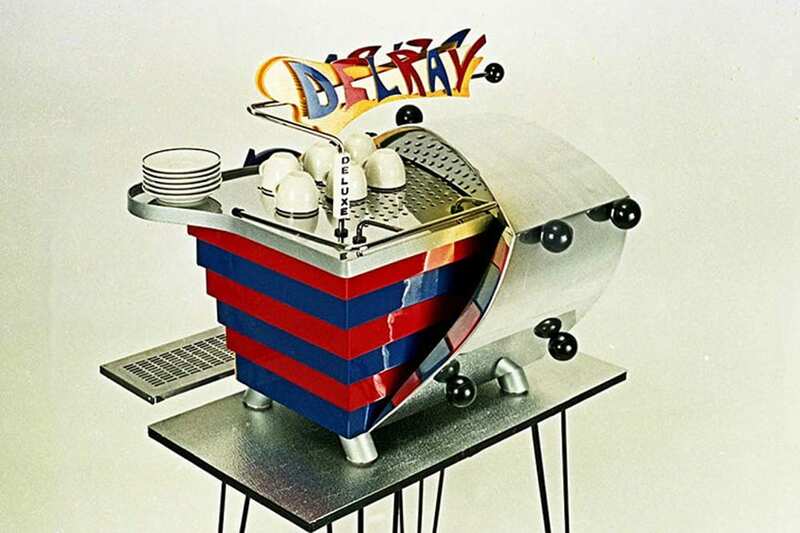 When after several years requests for this machine were still coming in, the original design was used to create a completely new one-group machine with fully new developed group and boilers. 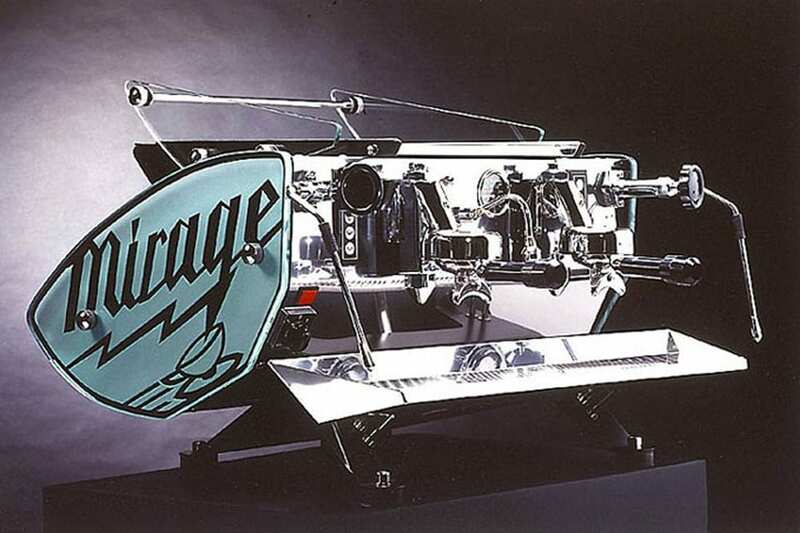 The lever group version of the Mirage, called Idrocompresso, developed in 2003. This one was done for “Art Gadgets” in Eindhoven, NL. They wanted a cold metal, technical look: Stainless steel frame sandblasted instead of powder coated in black. Veloce aluminium side-panels, lettering in grey, combined with high gloss bodywork. 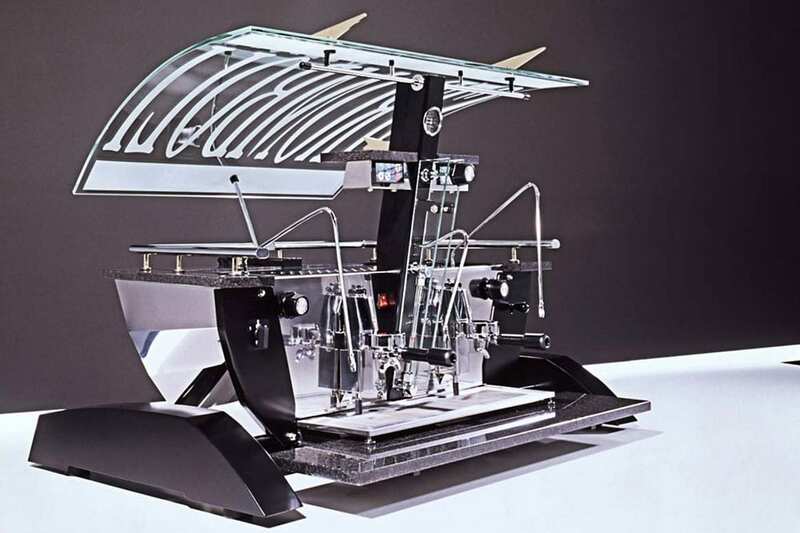 For some years we made true glass hoppers, as can be seen behind the machine. 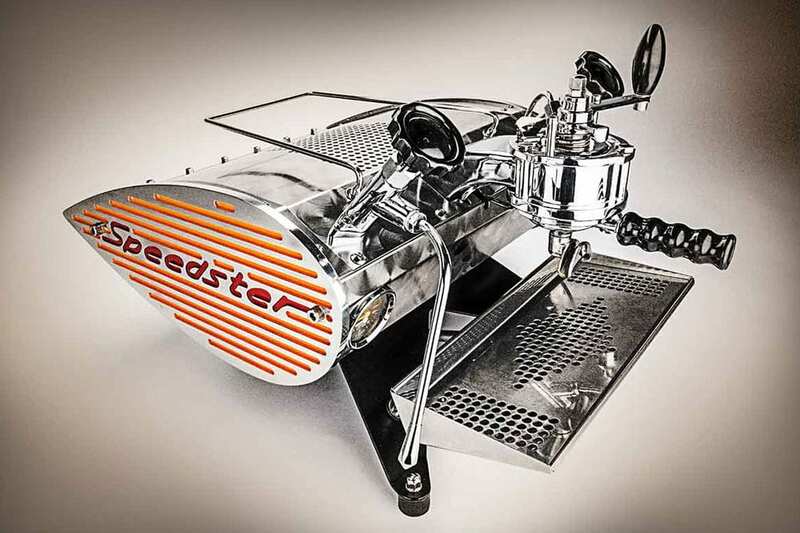 Kees developed our own large saturated group with boiler, used for the first time in the series Speedster. The machine is equipped with a fully separate large steam boiler. Several means of pre-infusion as standard. In fact a large, commercial Speedster. 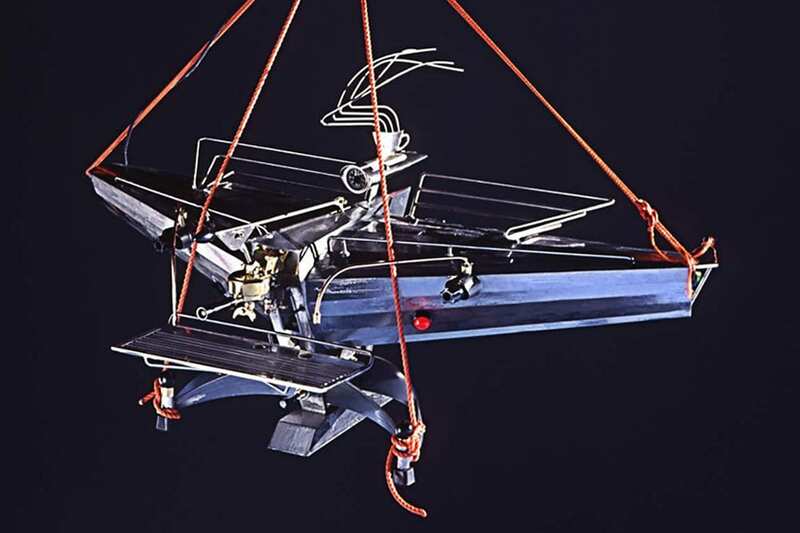 The very first prototype was introduced at the London S.C.A.E. show in 2010. In 2012 a pre-production series was started. From there the Spirit developed into the complete machine it is now. Filling the gap between Mirage and Spirit, the Slim Jim offers a fitting combination of looks, technical set-up and thus price, of the two. An added point of attraction is the wealth of available options. 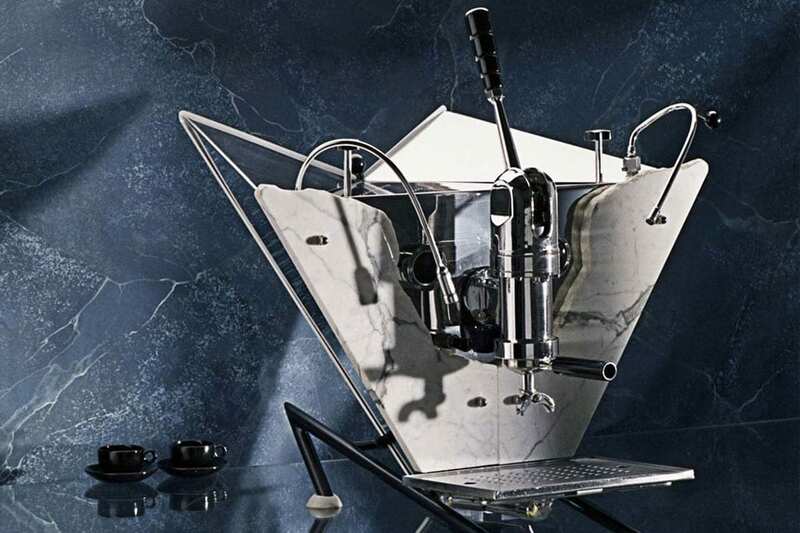 KEES VAN DER WESTEN ESPRESSONISTIC WORKS B.V.
DO YOU WANT TO RECEIVE THE LATEST NEWS & UPDATES? © 2019 Kees van der Westen.